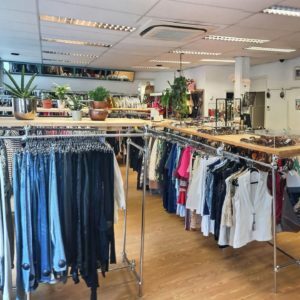 De Ruilhoek has been one of the largest second-hand clothing stores since the late 1970s, with brand and designer clothing for women, men and children. Spread over two floors, the store has an area of approximately 200 square meters and is located in de Rivierenbuurt, in the South of Amsterdam. The daily changing collection is strictly selected. We mainly sell brands from the higher segment. If we have enough space, we will also take the latest collections and more expensive lines from, for example, the Hennes & Mauritz or the Zara. Every day we price around 300 articles, that go directly into the store. The guideline is that we price articles for a quarter, to a maximum of one-third, of the new price. We search every brand online and then check what the price is of a similar, new item. The purchasing customer therefore always has a good deal and the contributor, seller, receives a fair amount for his or her contribution. 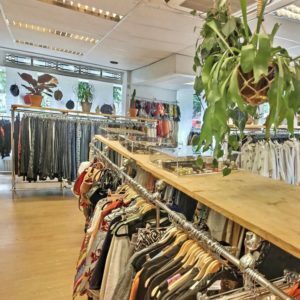 In addition to the physical store, there is also the possibility to buy clothing at the Ruilhoek online. Online you will only find items from top designers, who meet strict criteria. These items are not older than two years, with a minimum new value of around € 200,-. These clothes are not in the store, but they are in stock. If you inquire about online garments in the store, you can therefore fit the items directly into the store. That way you save any shipping costs! View the offers in our online store. You can bring in clothing without an appointment on workdays from 9 am to 5 pm and on Saturday from 10.30 am to 5 pm. To become a customer, a selection must be made of at least seven items that are suitable for sale in the store. After the first time, there is no minimum requirement. The customer can immediately check the status of the contribution online with a customer number and have the balance booked by bank. 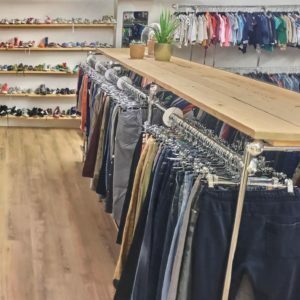 If you want to know more about selling clothes via the Ruilhoek click here. Do you want to be kept informed of new online items or special events such as the Supersale? Then sign up for our newsletter! We limit ourselves to a monthly newsletter and occasional announcements of special events. You can also follow us on Facebook or Instagram.